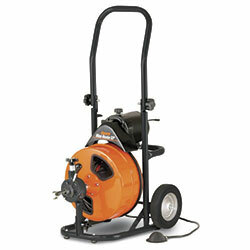 The Mini-Rooter XP’s power cable feed clears clogged lines from 1-1/4 to 4" in diameter with just one machine. The drum easily holds 75 feet of 3/8" or 1/2" Flexicore® cable and features a free-floating inner drum to prevent cable tangling. For smaller drain diameters‚ use the optional J-drum (see stock # 49812). Fold down the built-in handle to fit the unit easily in your truck. Includes: 75 ft of 3/8" Flexicore cable and Mini-Rooter cutter set.